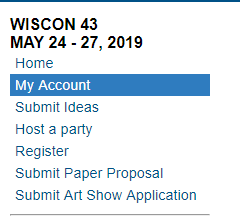 They should be emailed to gohnoms@wiscon.net, and the deadline is November 28. We’re very excited to announce that the Panel Sign-Up and Interest Survey will go live in 2 weeks! On February 26th, get ready to give us YOUR feedback on what panels will run during WisCon 42. You will need a WisCon account in order to view the survey. If you don’t have an account, create one at the “Create Your Account” page. For those with an account already created, go to “Log in to My Account” page. Come February 26th, you should see the link to the survey once you have logged into your account. So mark February 26th on your calendars! It can be hard to know when and how to acknowledge death when it happens in a community. When do you write a blog post, and when don’t you? But it seems impossible not to make a statement upon the death of a treasured member of our WisCon community, one of our greatest and most influential writers, Ursula K. Le Guin. Ursula Le Guin attended WisCon thrice: WisCon 2, WisCon 20, and WisCon 30. She came to WisCon 2 (February 1978), in support of her friend Vonda McIntyre, our 1978 Guest of Honor. She was invited as Guest of Honor in her own right the first time we celebrated a landmark year, for WisCon 20 (May 1996). And she was one of the many prior Guests of Honor we invited to be part of the WisCon 30 celebrations (May 2006). As writers under repressive regimes have long understood, science fiction is particularly well suited to the indirect but intense examination of the political and moral status quo, since its tropes and metaphors (outer space, far future, etc.) allow the writer to look from a distance at what is actually very close at hand. As the scholar Darko Suvin said, science fiction is the mirror that lets us see the back of our own head. This is notably true when it comes to issues of gender. No other literary form has asked so many questions so usefully about the nature and construction of human gender, the actual and possible relation of the sexes in society. When they wanted to ask such questions, realistic novelists such as Margaret Atwood and Doris Lessing turned naturally to science fiction. A good many of the talks and papers read at WisCon concern these subjects and ask these questions. The atmosphere of the conference is extremely open, uncoercive, and intellectually stimulating. Academics who attend it are often delighted by the freedom of discussion without competition. To women academics it is of particular value, as they seldom find so supportive a milieu. Women writers treasure it for the same values of freedom and support. Men and women who confuse feminism with misandry may be kept away by their own prejudice, but one of the happiest aspects of WisCon is the presence of men who relate to women with total equality of expectation on both sides—a refreshing experience for all. What WisCon does above all is affirm a community of writers, scholars, and readers brought together by a sense of dissatisfaction with our society’s solution to many problems of gender and justice, plus a sense of hope that with intelligent and ethical work we can achieve a more just and less destructive society. They share in common a courage of the imagination which may yet justify that hope. The fact that they’ve been meeting for thirty years to exercise and celebrate such courage is cause itself for hope. 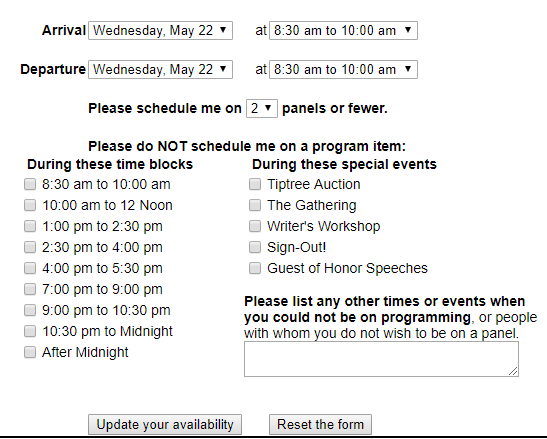 WisCon 40’s ConCom briefly considered the idea of inviting all past Guests of Honor back for 2016, in the tradition of WisCon 20 and WisCon 30. It may have been coincidence, but the conversation didn’t last for long after a tangent on Ursula’s health, and the fact that she rarely traveled far from home anymore. We’ve continued to treasure her and her outlook in her absence. A few years ago, during a time of vociferous disagreements within our community, many of us spent time interrogating whether WisCon was “worth it”—worth the labor, both tangible and emotional—that we invest to sustain it, and that the convention itself sparks. People like Ursula remind us why it is worth all that and more. She imagined impossible futures, and she shared them. She held that it was important work to do so, and had little patience with authors who dismissed science fiction and fantasy as trivial or lesser genres. “Fantasy is probably the oldest literary device for talking about reality,” she said in a blog post eviscerating Kazuo Ishiguro for sneering at the fantasy genre. She used her writing to explore concepts like gender, capitalism and truly fair societal structures. Her body of work is a testament to the conversations that people have at WisCon every year. What other shapes could society take? What would a more just, more equitable, and more inclusive world look like? Much is made about her female protagonists. There’s already one obituary from a national newspaper remarking on her “tough-minded feminine sensibility,” missing the point almost entirely in a way I’m sure Le Guin would have relished skewering. Reductive obituaries, like that one, ignore the variety of incredible and alien outlooks she managed to portray, her protagonists who fall outside of the gender binary, and the fact that so few of her characters were white. Resistance happens because people can imagine a different reality—because they demand a different reality. Ursula K. Le Guin showed us how to imagine and demand better from our society. We will miss her. We will not forget her. Rest in power, well-loved one.